Ahoy, matey! 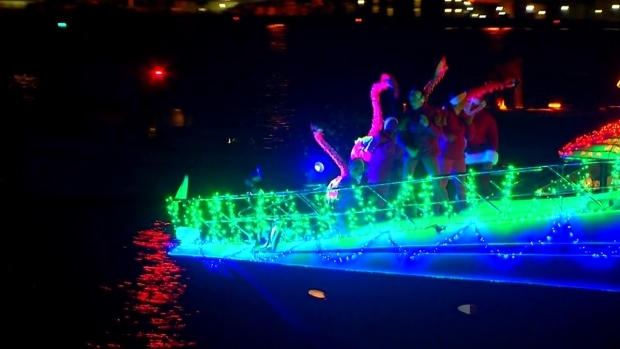 Boats decked out in glimmering, festive lights cruising the San Diego Bay can only mean one thing: a beloved holiday parade is back, continuing a longtime tradition started by the local boating community. The 47th annual San Diego Bay Parade of Lights will bring dozens of vessels covered in twinkling lights and holiday decorations to the San Diego Bay to delight thousands of onlookers this Sunday, Dec. 16. Presented by the Port of San Diego, the waterfront procession features approximately 80 lavishly decked out boats illuminating the bay. Usually, the parade takes about an hour to pass at any given point. It begins at Shelter Island at 5 p.m. and, by about 5:30 p.m., will be making its way through Harbor Island. A half-hour later, the procession moves to the Embarcadero, passing the Berkeley Ferry and Star of India near the Maritime Museum of San Diego. By about 6:30 p.m., the boat parade should be visible from Seaport Village and the San Diego Marriott Hotel and Marina. For the third year, the route will then move on to the pier at Cesar Chavez Park before making the turn to Coronado where it can be seen from the Ferry Landing at around 7 p.m. The parade finishes at buoy 22A. As each boat passes the viewing points, announcers will deliver a brief history of the vessels. The San Diego Bay Parade of Lights typically draws about 100,000 spectators. Two popular areas to perch during the parade are the Maritime Museum of San Diego on the Embarcadero and the Ferry Landing in Coronado. The Maritime Museum will host its Parade of Lights Viewing Dinner during the event, an annual fundraiser aboard the Berkeley steam ferry where the judging and awards for the parade take place. The party includes a seasonal dinner and a cozy, prime spot from which to watch the parade. Tickets to this viewing dinner cost $50 for adults and $25 for kids. The parade is scheduled to reach this viewing area at around 5:30 p.m.
Spectators also tend to flock to Harbor Island, as well as the north and south ends of the Embarcadero. Parade organizers say another prime viewing spot is the park behind Seaport Village and the new pier at Cesar Chavez Park. Boaters wishing to watch the parade can view from the water; organizers say the area where the parade turns west for Coronado – near the 10th Street Terminal – is a good point for spectators in boats. As always, parking along the waterfront will be at a premium for this large-scale event. Attendees can opt for public transit, as all three MTS trolley lines and several bus lines serve stations with parking lots where spectators can leave their cars – Fashion Valley, Old Town, American Plaza – and then take the trolley to the North Embarcadero area. The Green Line can be taken to Santa Fe Depot and the Orange and Blue lines to the American Plaza station. Both stations are within walking distance from Harbor Drive – another solid spot from which to view the procession. You can check the MTS website for trolley schedules and updates. This year, the theme is "Tropical Island Christmas," so decorations will likely include some pineapples and palm trees. As San Diegans know, the décor for this unique parade is always festive and always flashy, a big part of what makes the San Diego Bay Parade of Lights a true local tradition. An NBC 7 photojournalist captured this video of the annual event that draws thousands to the shores of San Diego Bay.